One to three tablets to be swallowed with water every 4 hours, or as directed by your doctor. Not more than 4 doses in any 24 hours. A lower dose is recommended for the elderly. Do not give to children under 16 years of age unless advised by a doctor. If symptoms persist for more than 3 days, consult your doctor. 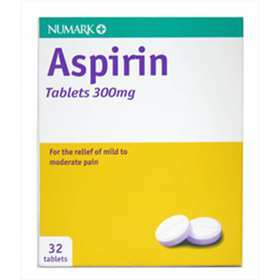 Each Numark Aspirin tablet contains 300mg aspirin. Also contains: lactose, potato starch and talc.